Brighton & Hove Albion striker Aaron Connolly will join League One leaders Luton Town on loan once he has fully recovered from his hamstring injury. The 19-year-old signed a new long-term contract with Albion earlier today and has completed a move to Luton on loan for the rest of the season. Connolly will continue his rehabilitation from his hamstring injury at Brighton and will still be eligible for Albion's under-23 team. He is expected to feature in Premier League 2 before he links up with Luton. Connolly has scored 17 goals for Albion's under-23 team this season and has represented Republic of Ireland at under-19 level. 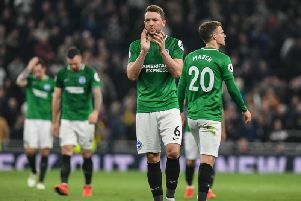 Brighton under-23 coach Simon Rusk said: “This agreement gives Aaron the prospect of a first loan spell playing senior first-team football in League One.